Here are a couple for the books. The first was taken from "Dragonfiles" and tells of a water landing Dragonfly builder Tom McCutcheon made after his engine quit over Coos Bay, Oregon. There are some vital lessons here. "My landing was in the bay. I had the option of a small island, but there were too many stumps and logs on it...I'm told that almost all fixed gear airplanes that land in water go upside down. If it (an emergency landing) happens in the Dragonfly, water may be the better option for your safety. I have a front-hinged canopy and I unlatched it just prior to landing on the water. However, as I went over forward upside down, the water pressure closed the canopy again. As I was hanging there upside down in my harness, I tried to open the canopy again but couldn't. I thought it was jammed. I was still totally dry. I finally realized that if I did get it open my head would be in water. So, I put my left arm on the canopy to catch myself as I released the harness. At that time the cabin flooded. I had to INSTANTLY turn over to keep my head above water. When everything stabilized there is about 4 to 16 inches of air pocket in the seat area. The tailcone remains well in the air so you have lots of air supply. So, DON'T PANIC. There is plenty of air. Also, it will take a few moments for the water pressure to equalize on the canopy before you can open it. When this happened, I could get out and get on top of the airplane (or bottom, since it was upside down). I believe that the canopy protected me from being knocked out and drowned, so it may be advisable to keep the canopy down in a water landing...if you do land in water...land in deep enough water that will allow the canopy to open enough for you to get out. ...it was actually only 6 or 7 feet deep where I went in. When my canopy did open, it was hitting on the bottom of the bay. Too shallow water could trap you for a long time...The water temperature should be considered...I have been told that 55 degrees F is good for about 30-60 minutes of life maximum without a survival suit. The first people to my rescue were two fellows in a canoe...15 minutes later two power boats arrived...30 minutes later a Coast Guard power raft showed up, and 5 minutes after that the Coast Guard helicopter finally got there. This all took place about a mile from the Coast Guard boat and 2 miles from the airport where the helicopter was so don't rely on any quick response from emergency people. Mark your canopy release well so that ANYONE can help you. ED. NOTE: Tom only got a scratch on each knee from the instrument panel. His prop stopped in the vertical position and he had no time to crank it horizontal. On landing in the water, Tom held full stick back (elevators down) and the aircraft skipped before coming to rest with the left canard broken at the root. 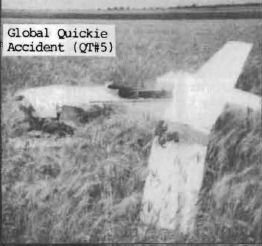 QT #5 outlined a Q-200 accident in Canada, which developed as the result of a wing failure during a pull up after a low pass over the runway. Transport Canada did an unusually detailed examination of the wreckage (unusual in this writer's experience, at least) and made some findings that are of great value to all Q-type builders and pilots. Just 2 months shy of his 26th birthday, Bill Carruthers, Jr. departed his Ohio home to seek his fortune in Alaska, the state of his birth. Bill aimed his yellow and white Q-200, N5538N north, destination Haines, Alaska. Enroute, he landed in Brandon, Manitoba, Canada and while transiting the next leg of his trip he felt that his Continental O-200A engine was not producing full power. He landed at Dawson Creek to rectify the problem. With tools borrowed from Westwind Aviation, he worked on his aircraft over the next 3 days. On the evening of June 30, 1987, shortly after 2200 hrs., Bill contacted the Flight Service Station at Dawson Creek airport and informed them of his intended test flight. He took off down the runway about 2210 and proceeded to fly around the general area of the airport. In his last transmission at 2231 hrs., he informed Flight Service that he was 3 miles west of the airport and was going to make a low pass down runway 06. A witness was standing outside his office with a camera to take a picture of the aircraft on the fly-by. He observed the aircraft make a pass parallel to the runway at about 200'. As it passed the terminal it began a pull up maneuver whereupon the left rear (main) wing was observed to fold over the top of the fuselage. The aircraft rolled left and crashed impacting the ground at a 30-degree angle and started breaking up. It left a wreckage trail of approximately 112 feet. The pilot was thrown clear of the wreckage but was pronounced dead at the scene from blunt force trauma and multiple impact injuries on his left side. Weather was not a factor in this accident. Wind was 130 degrees at 4 knots, scattered clouds at 29,000' and 40 miles visibility. The aircraft was originally certified on October 23, 1985. On the 24th, there is an aircraft log entry indicating that a noticeable right roll was observed on the second test flight. On December 12, 1985, the aircraft ran off the runway damaging the leading edge of the left rear wing. In July '86 a change to an 0-200 engine was completed as were repairs to the left rear wing; June '87 the canard was remounted to +.75 degrees and the rear wing washout was adjusted using solar heating. It was this solar heating that came under the closest scrutiny by Canadian Aviation Safety Board Investigators. To correct the noticeable right roll, Carruthers apparently sprayed the upper wing surface black to absorb solar heat and retwisted the wing to correct the washout angle. Most composite builders have heard of this procedure. However, the engineering investigators found that the core construction of the left wing was not in accordance with the design of the Q-2. For some reason, the outboard core of the left wing was composed of 3 "sheets" of the proper foam laminated one on top of the other rather than a solid core as required by the design. These sheets were not adequately glued together as evidenced by the cleanliness of the gaps that were found between the sheets. The greatest depth of gap was 0.125". A gap of 5" chordwise running from BL 50 outboard was found between the bottom and middle layers and a similar gap 4" chordwise with the same run between top and middle layers. These gaps were probably further opened during the solar heating and twisting thus diminishing the torsional stiffness of the left wing. The wing appears to have failed by static divergence, that is the phenomenon where wing lift twists the wing increasing its angle of attack, which generates more lift, further twisting and so on until failure occurs. The Q-2 wing gets its torsional stiffness from two 45 degree plies of UNI oriented 45 degrees to the spar axis and 90 degrees to each other. Investigators took 40 samples of the wing surfaces. They found angular alignment errors of the + or - 45 degree torsion resisting plies. The second 0 degree ply of the skin on the upper surface between BL 30 and 40 had a kink in it. 9 areas of the left wing skin had palpable bubbles in it (the largest 3"x2") almost certainly caused by the wing twisting/solar heating. The outboard trailing edge of the wing was almost double the normal skin weight due to the heavy use of filler. "5.5 Some home-builders believe that the foam inside the wing serves no structural purpose. They are incorrect. The foam holds the stressed skin out in the proper position so that it can carry the wing bending airload. An analogy would be the air pressure in a sausage balloon. The air, while incapable of carrying other than a pressure load, keeps the balloon skin from collapsing so that the skin can carry a structural load." Our very great thanks to the Canadian Aviation Safety Board for this immense and thorough report. 400 Quickie/Q-2/200 builders will take note and share the knowledge. Additional thanks to QBAer Arnold Forest who was the link in the chain that got this report to us.